Manufacturing solar hardware in North America is not for everyone. In fact, it’s not for most. Pricing pressures, especially for solar PV modules, has forced many solar companies to shutter U.S. factories and consolidate manufacturing overseas. Some of those companies are now debating whether to build U.S. factories given the potential looming tariffs due to the ongoing Suniva Section 201 trade case, but ramping up would likely take years. For those that have continued to maintain a manufacturing presence in the U.S., however, they see a distinct advantage no matter what happens with the trade case. The U.S. trade commissioners unanimously agreed on September 22 that the import of crystalline-silicon solar equipment has caused "serious injury" to domestic manufacturers, although they exempted imports from Canada, Singapore and several free-trade partners in South America. Inverter manufacturer KACO New Energy, for example, would not be affected directly by the trade case as it pertains to manufacturing, but would feel the overall market impact if tariffs make some U.S. solar projects economically unviable. The Solar Energy Industries Association estimates that there are more than 250,000 solar jobs in the U.S., although less than 1 percent of those are manufacturing-focused. If the tariffs are imposed at the levels requested by Suniva, however, nearly 90,000 U.S. jobs could be affected, according to SEIA. Whether they make inverters, modules or trackers, the companies that are committed to U.S. manufacturing point to an ability to respond to regional market needs faster with a combination of local manufacturing, servicing and R&D. GTM Research analysts noted in response to the trade case decision that manufacturing helps drive innovation. One of the most basic advantages to local manufacturing is shorter lead times, which reduce risk. “If we don't have to ship something from overseas, that eliminates another layer of potential risk,” said Mall. “We can meet lead times that others can’t.” Mission Solar also pointed to its ability to meet special requests with shorter turnaround times. In the inverter space, service is a considerable component of the business, and having a local presence that brings together R&D, manufacturing and service expertise is key. “If you need support [for engineering questions] from a subsidiary overseas, the level of response is incomparable to a partner with localized support,” said Mall. Solar tracking manufacturer NEXTracker also sees an advantage to a highly localized approach, with manufacturing in more than 30 countries, and sales support to go along with it. For module manufacturers, service support close to the manufacturing hub may not be as critical as it is for inverters or trackers, but North American-based module manufacturers do point to the quality of their engineering teams to produce a higher-quality product. Silfab touts its Canadian facility as having the lowest defect rate for modules sold in the U.S. Mission Solar noted the ability to tap the global talent pool available in the U.S. that allows the company to have an exceptionally high-quality design and engineering team that sits right next to the production team. While there are upsides to a local presence, there’s no denying the challenges. Mission Solar, for example, laid off 170 people at the beginning of this year as it restructured and pivoted to residential and C&I products. The company is now scaling back up and rehiring, said Martens. Thin-film manufacturer First Solar, which also has some U.S. manufacturing capacity, modestly raised its guidance earlier this year after restructuring and optimizing its manufacturing late last year, which included laying off 450 people in Ohio. 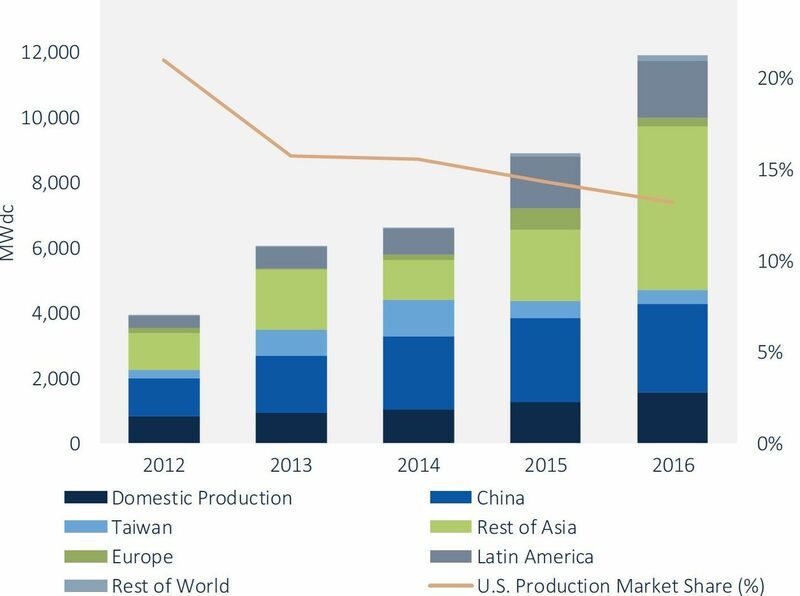 Overall, America’s share of global solar manufacturing is on a downward trend, according to GTM Research. Just as the U.S. solar market is highly diversified among states and regions, for solar manufacturing in the North America, local is in the eye of the beholder. KACO sees San Antonio as its hub for all of the Americas, and does not see the need for an additional facility in Latin America at this time, although that could change in the future. NEXTracker, on the other hand, expanded its manufacturing presence in in Mexico last year, although it also manufactures in the U.S. With Canada exempt from any decision regarding the trade case, some companies may look to expand manufacturing just north of the U.S. border. 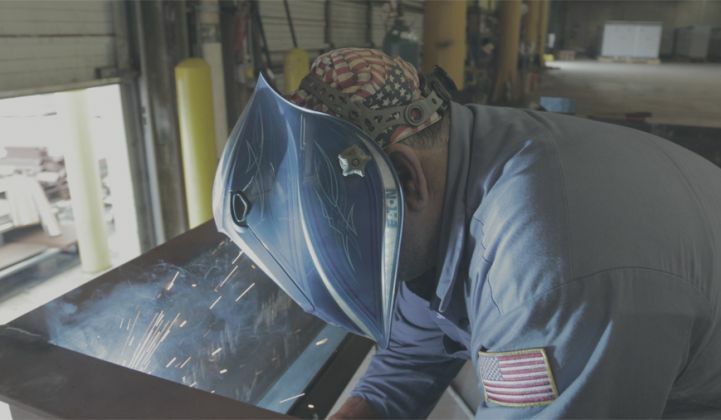 One issue for those that choose to manufacture in North America is the presence of a robust local supply chain, something that allows them to further shorten their lead times. “Material sourcing and transportation is challenging,” said Martens. That problem only grows more acute as more module manufacturers pull out of the region. When NEXTracker expanded in Mexico, for instance, it pointed to the benefit of the increased capacity reinforcing its local supply chains. A robust supply chain is one of the reasons that China has been able to push down the cost of module production. GTM Research analysts have argued that the U.S. government could look at ways of subsidizing the supply chain as one way to beef up solar production domestically. If the government sets high tariffs in the trade case, some local manufacturers should have a leg up in the short term, but for some buyers, the importance of locally made products is already high. Many government contracts, whether local or national, favor locally made components. There are also some homeowners who care where their panels are produced and whether their local installers are working with U.S.-based suppliers. At the end of the day, however, all of these companies are competing on a combination of price and value -- not just the presence of a “Made in USA” sticker. “As the solar market becomes more educated and looks not just at the dollar-per-watt upfront cost, but also the long-term levelized cost of energy, there will be more value in panels that produce more power over a certain amount of time and also last longer," said Martens.